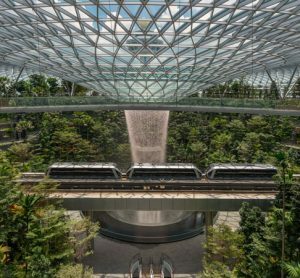 For International Airport Review, Raoul Cooper, Airport Transformation Design Manager for British Airways, takes a look at the latest innovative technology deployed by the UK’s largest global airline at terminals to help transform the airport experience for its customers. Biritsh Airways aircraft takes off from somewhere in the world, every 90 seconds. 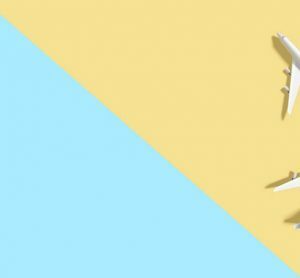 The UK’s largest global airline employs more than 45,000 colleagues and operates to more than 200 destinations, in over 75 countries across the globe. British Airways operates from four of London’s biggest airports and flies up to 145,000 customers every day. At the heart of our operation will always be our people – that won’t change, whatever advancements are made with technology, because we know our customers want to see a smiling, helpful face as they make their way through the airport, and have someone close by to ask questions. We know how important this is and will always maintain that presence – but at the same time we are actively embracing innovative use of technology to benefit our customers. has continued, and in 2017 we opened a new First Wing for British Airways Gold Executive Club members and customers travelling in first class – an exclusive check-in area and security channel which leads directly into our First lounge. At the beginning of 2017 we welcomed customers to our fantastic new home in the South Terminal at Gatwick which has a larger, brighter check-in area and a fantastic new lounge – as well as self-service bag drop facilities. 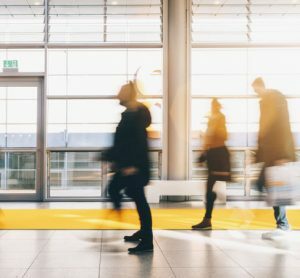 We know that frequent flyers want to travel without touching the sides at the airport – and benefit from the advantages of self-service technology – in the same way they do when taking public transport in the city and in the supermarket. Our aim is for customers to have a seamless experience when they travel with us. Today, 75 per cent of customers travelling from the UK use BA’s self-service channels to check-in – and the majority arrive at the terminal ready to fly. Across Heathrow and Gatwick airports, we are rapidly increasing the number of self-service bag drop points, so many customers simply drop their bags and head for the security channels. By the end of 2018, we will have almost 200 in use across our operation. 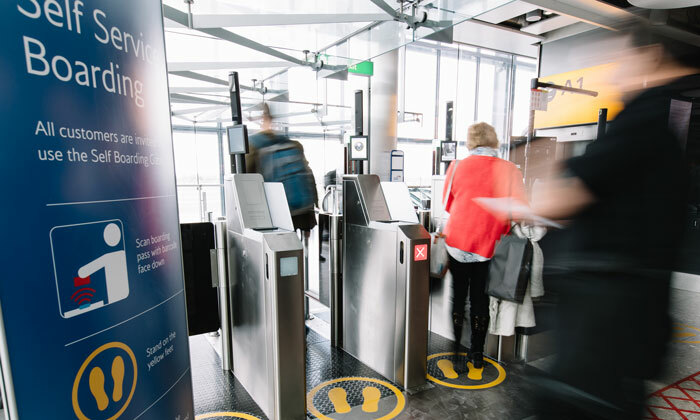 We are excited that we’re the first UK airline to introduce automated biometric technology throughout the airport with the launch of self-service boarding gates. 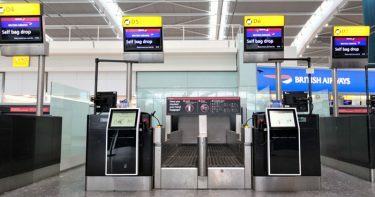 Following a successful trial, everyone flying on domestic flights departing from Heathrow Terminal 5 can board using facial-recognition technology. We know how important it is for our customers that their flights depart and arrive on time, and this technology has helped improve our boarding punctuality on domestic flights by 10 per cent. And we’re not just testing out this technology in the UK. Right now, we’re trialling self-service biometric boarding gates on international flights out of the U.S., working in partnership with Los Angeles International Airport. Customers will no longer need to present their passport or boarding pass at the gate – only at check-in and security. Instead, travellers can simply look into a camera prior to boarding, have their biometric data verified, and then walk onto the aircraft. 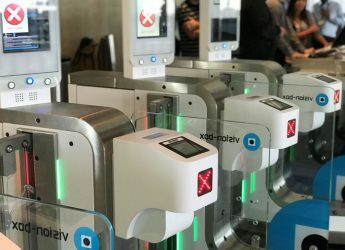 Similar to facial identification built into mobile phones, the biometric gates use high-definition camera technology, and allow customers to pass through by recognising their unique facial features, and reconciling them with the digital facial scan taken as part of the immigration process. Working in partnership with the U.S. Government and the Customs and Border Protection Agency to develop and approve the scheme, we’ve made great advancements, and we are giving customers a taste of what they can expect in the future. Biometric boarding isn’t the only way we’re improving punctuality. Heathrow is one of the world’s busiest airports (the busiest in Europe by passenger traffic) and an aircraft takes off / lands every 45 seconds. Every second counts for us and we’re constantly looking for ways of improving efficiency. Some of the technology we’re using, customers won’t see – such as our high-tech remote controlled Mototok pushback vehicles. We’re the first airline in the world to introduce these, and we’re using them across our short-haul operation. These eco-friendly Mototok tugs allow our ground staff to prepare aircraft for departure much more efficiently. They replace traditional diesel tugs, allowing a single ramp agent to push an aircraft backwards from the gate remotely. Emissions-free and capable of moving planes with precision, more than 750,000 customers have benefited from smoother departures already. And, we have seen a 72 per cent reduction in pushback-related delays on Mototok stands compared to the same period the year before. It’s this sort of technology that is making British Airways the most punctual, major short-haul airline in London. Our Mototoks will help us to stay at the top of the league and keep our flights departing on time. As a result of this success, we are now trialling the Mototok Spacer 195 to pushback our long-haul aircraft in the future. 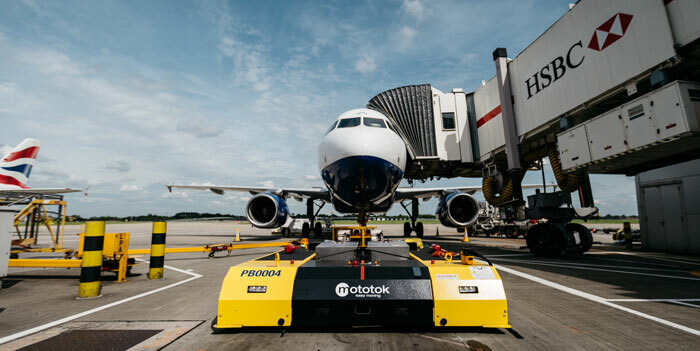 We have been working alongside Heathrow Airport to introduce the Mototok into our operation, and their roll-out forms an essential part of the airport’s sustainability strategy, Heathrow 2.0, and its goals to reduce emissions from our airside activities. We will continue to trial biometric technology at international airports, and the future will see customers using their unique facial features to identify themselves more frequently at check-points throughout the airport – making travelling easier while maintaining high levels of security. Along with our airport colleagues in New York, we are also investigating whether this technology can help speed up the airport immigration process. New thinking and ideas are integral to our business. This year, in conjunction with our parent company, IAG, we’re trialling driverless buses to see whether they could be beneficial to our operation. We’ve also started to introduce Wi-Fi onto our long-haul flights using the provider Gogo and its next generation high-speed 2Ku satellite network. Customers can work, browse and stream from the comfort of their seat. Ninety per cent of our fleet will be Wi-Fi enabled by 2019. Of course, as an airline, you’d expect us to have new plans for our fleet too. A £4.5 billion investment over the next five years will see us take delivery of 72 new aircraft and introduce new interiors for 128 of our long-haul aircraft, which will ensure that customers have a modern and comfortable environment. We know our customers have high expectations, especially when it comes to technology, so we will continue to seek opportunities to transform their journey through the airport. Standing still is not an option. Raoul Cooper has worked in aviation for more than 20 years in various fields – including commercial, operations, and IT. 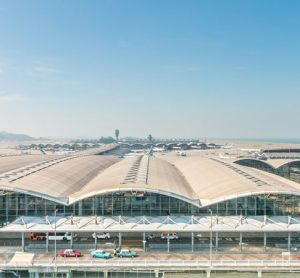 In his role at British Airways, Raoul manages the strategic direction for what the airline terms ‘Airport Transformation’, developing innovative technology solutions to improve customer experience at the airport. By putting digital transformation at the heart of new ways of working, his aim is to put British Airways customers in complete control of their own journey.